Atlantic croaker (Micropogonias undulates) are a bottom-dwelling species, in the same family as red drum and weakfish. They can be found from the Gulf of Maine to Argentina, but along the US Atlantic coast, they are most abundant from the Chesapeake Bay to northern Florida. Their name is derived from croaking noises they make during the spawning season by vibrating their abdominal muscles against their swim bladder. Atlantic croaker spawn in warm pelagic waters during the fall and winter months, and the larvae and juveniles settle in estuaries to mature. The Chesapeake Bay is an important spawning and nursery habitat for croaker. Most Atlantic croaker are mature by the end of their first year. They grow quickly and may reach sizes of over 20”. The world record for Atlantic croaker is 8 lbs 11 oz. The oldest observed age is 17 years, but it is uncommon to see fish older than 10 years in the catch. 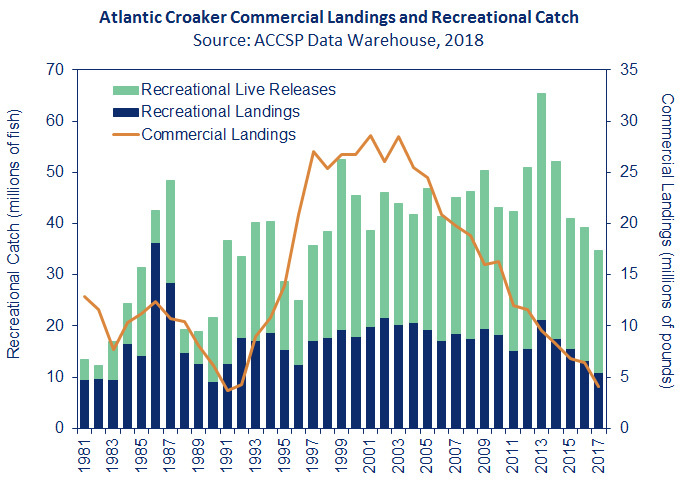 Sought by recreational anglers and commercial fishermen alike, an estimated nine million pounds of croaker were landed in 2017, with approximately 46% landed by the commercial sector and 54% harvested by recreational anglers. This represents a 27% decline in total landings from 2016 and an 81% decline in total landings from the 1981-2017 time series peak in 2003. Virginia harvested the majority of croaker, with approximately 70% of the harvest from each sector. Atlantic coast commercial landings of Atlantic croaker exhibit a cyclical pattern, with low landings in the 1960s to early 1970s and the 1980s to early 1990s, and high landings in the mid-to-late 1970s and the mid-1990s to 2011. Commercial landings increased from a low of 3.7 million pounds in 1991 to 30.1 million pounds in 2001; however, landings have declined consistently since 2003 to 4.1 million pounds in 2017. From 1981-2017, recreational landings from New Jersey through Florida have varied between 2.8 million fish and 11 million fish. Landings general increased until 2001, and held stable from 2001-2006 before exhibiting a declining trend from 2007 through 2017. 2017 landings are estimated at 11 million fish. The number of recreational releases has increased over the time series. In 2017, anglers released roughly 23.9 million fish. In 2017, a benchmark stock assessment was completed. This assessment used a stock synthesis model to address a major source of uncertainty from previous assessments – the magnitude of croaker bycatch in South Atlantic shrimp trawls. However, due to conflicting trends in abundance and harvest, as well as other uncertainties, this assessment was not recommended for management use. A traffic light analysis (TLA) is typically conducted each year to evaluate fishery trends and develop state-specific management actions (e.g. bag limits, size restrictions, time and area closures, and gear restrictions) when harvest and abundance thresholds are exceeded for three consecutive years. The name comes from assigning a color (red, yellow or green) to categorize relative levels of indicators that reflect the condition of the fish population (abundance metric) or fishery (harvest metric). For example, as harvest increases relative to the long-term mean, the proportion of green in a given year increases, and as harvest decreases, the amount of red in that year becomes more predominant. The TLA improves the management approach as it illustrates long-term trends in the stock and includes specific management recommendations in response to declines in the stock or fishery. Similar to the benchmark assessment, recent TLA runs showed conflicting trends, with significant decreases in overall harvest but increases in adult abundance and some juvenile abundance. Based on these conflicting trends (theoretically, an increase in abundance should lead to an increase in harvest), the Technical Committee evaluated the TLA and recommended several adjustments, including incorporation of additional abundance surveys, application of age-length keys and length compositions to all abundance surveys to better estimate the number of adults, use of regional rather than coastwide metrics, a new reference time period, and a new triggering mechanism. In August 2018, the TLA was presented to the Board using both the current and Technical Committee-recommended methods. The current method showed similar results of increasing adult abundance with declining harvest but did not trigger management action. The results of the Technical Committee-recommended method, which included all proposed changes, triggered management action due to significant declines in harvest and adult abundance in the Mid-Atlantic (north of Virginia-North Carolina border) region. Rather than taking immediate management action in response to the Technical Committee-recommended TLA, the Board delayed action until the states had the opportunity to gather public input from their constituents on what potential actions could be helpful to the stock and fishery. Atlantic croaker are managed under Amendment 1 to the Interstate Fishery Management Plan for Atlantic Croaker (2005) and Addenda I and II (2011 and 2014). The Amendment does not require any specific measures restricting harvest but encourages states with conservative measures to maintain them. It also implemented a set of management triggers, based on an annual review of certain metrics, to respond to changes in the fishery or resource and initiate a formal stock assessment on an accelerated timeline if necessary. Addendum I revises the management program's biological reference points to assess stock condition on a coastwide basis as recommended by the 2010 stock assessment. In August 2014, the South Atlantic State/Federal Fisheries Management Board approved Addendum II to Amendment I to the Atlantic Croaker Fishery Management Plan (FMP). The Addendum establishes a TLA to evaluate fisheries trends and develop state-specified management actions (i.e., bag limits, size restrictions, time & area closures, and gear restrictions) when harvest and abundance thresholds are exceeded. The TLA is a statistically-robust way to incorporate multiple data sources (both fishery-independent and -dependent) into a single, easily understood metric for management advice. It is often used for data-poor species, or species which are not assessed on a frequent basis, such as blue crabs in North Carolina and snow crabs in the Gulf of St. Lawrence. Additionally, in March 2017, a report on Sciaenid Fish Habitat was released including information on habitat for several species, including Atlantic croaker, during all stages of their lives, their associated Essential Fish Habitats and Habitat Areas of Particular Concern, threats and uncertainties to their habitats, and recommendations for habitat management and research. This report is meant to be a resource when amending future species FMPs.